A teenage girl yearns for the guy next door, even when it turns out he’s immortal, in this first installment of Walters’ (Demons, 2015, etc.) YA paranormal romance series. Raine Cooper, nearly 17, has been best friends with Eirik Seville ever since they were kids. But just when romance develops between the two, Raine attracts the interest of dishy new neighbor Torin St. James. And there’s something special about Torin beyond his looks: he somehow scratches her Sentra without anyone seeing him near it. Raine scoffs at his claim of magic, but when cracked ribs impede her breathing, Torin’s there, and her pain inexplicably vanishes. As it happens, he’s an Immortal, and Raine’s caught the attention of a few more: Andris and sisters Maliina and Ingrid, Norwegian exchange students in Kayville, Oregon. 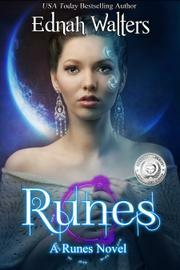 Far from a run-of-the-mill Mortal, Raine can see the Immortals’ magical runes drawn on skin or walls. It’s clear that Maliina hates Raine (having provided her with the rib-cracking), but there may be another threat to the teen, who’s too scared to drive her car, which someone covered in runes. Even if Torin’s intent on protecting Raine, he’s not exactly forthcoming, refusing to explain precisely what Immortals are. Once Raine finally gets answers, she’ll make a decision that will change her life forever. Like any effective series opener, this novel brims with mystery. There’s a hint, for example, that Raine’s father, missing since a plane crash only months before, may have a connection to Torin and the others. The plot centers on romance, a mutual attraction (primarily Raine ogling Torin) that deepens as the two stay on each other’s minds constantly. It’s melodramatically enticing—and perhaps a little cruel—that, despite Torin’s undeniable appeal, Raine keeps Eirik around. The devotion of so much of the narrative to the love triangle unfortunately sidelines the supernatural elements. Nevertheless, a stirring final act clarifies the Immortals, not only their purpose, but their plan as well, putting more than one person in danger. There’s plenty left unresolved for future books, including Eirik, who seems to know more about Torin than he lets on. Aptly introduces characters and relationships, while merely teasing the story’s fantastical qualities.